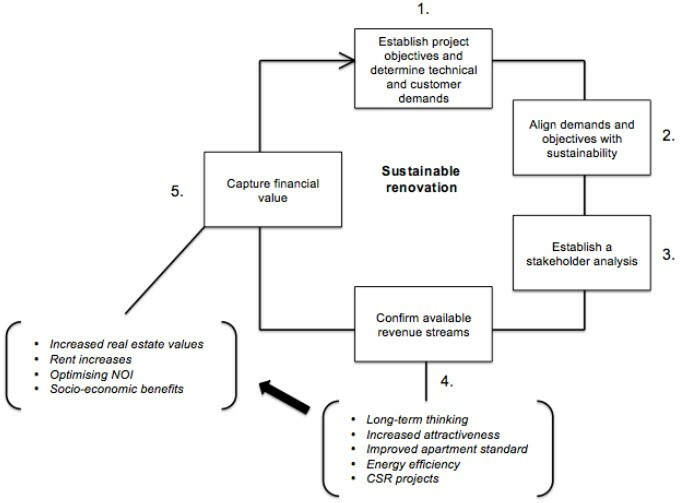 The goal of the thesis is to demonstrate that it is possible to obtain energy savings far beyond the 2020 levels (20%), namely 50% of the final energy consumption, when renovating a Miljonprogram multi-storey residential building by using well-established refurbishment technologies available on today’s market (it should be noted though that the 20% is about the greenhouse gases emission, while the 50% considered in this thesis is about the final energy consumption of the building). The 50% is indicated by ASHRAE as the first step to reach the net-zero building goal (ASHRAE, 2016). 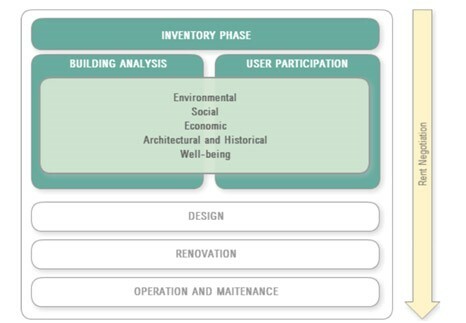 The other aim of the thesis is to identify and describe the present renovation technologies, by making a state-of-the-art which will act as a database for choosing the refurbishment solutions that are most suited for the building. To address the problem and reach the goal, both a qualitative and qualitative approach were applied. The first step was the case study of current renovation projects, both at Swedish and European level. Completed and ongoing projects, concerning renovation of post-war multi-storey buildings were analysed to identify and list the renovation measures, to understand the current practice and get insight on the driving forces/hindrances behind the renovation process. 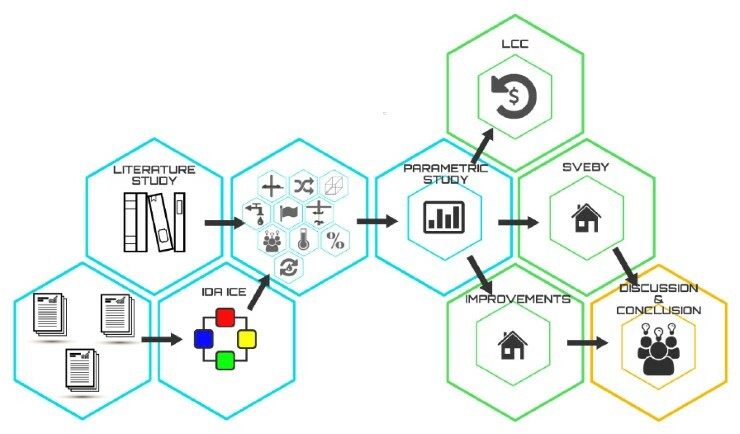 A literature review on renovation state of the art (methods and technologies) was then performed: the most used technologies, found studying the renovation projects, were listed and described by identifying the climatic area where they are applied, their pros and cons and their future developments. 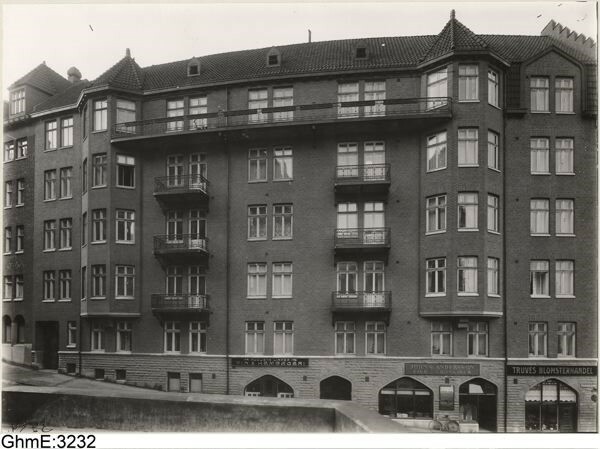 A building from the Miljonprogram was then selected as study case, after having performed an analysis in terms of age, ownership and type of the Swedish and European building stock, to understand the relevance of the study from a European perspective and see which type of multi-family post-war house is the most common in Sweden. Some renovation scenarios were then defined, by setting up packages of the renovation measures described in the state-of-the-art. 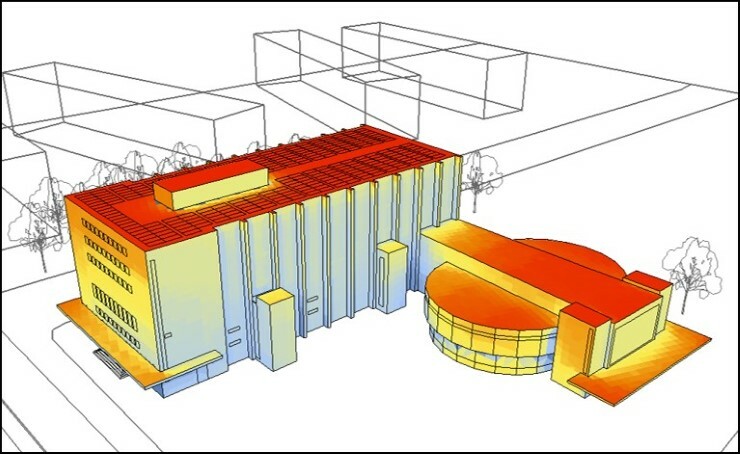 The building was modelled by using VIP-Energy and simulated to estimate the impact of the different proposed packages on its final user energy consumption in terms of kWh/(m2year), by analysing different scenarios. The intention was to apply passive measures (i.e. constructive measures on the envelope) for the first two scenarios, and to implement active measures for the ambitious goals of the last scenario, such as installing a heat recovery system for the ventilation. The heat recovery is also tested in all scenarios to see how it affects the final energy consumption of the building. 27 energy efficient measures to reduce the energy consumption of the building were identified and described, by classifying them in tables to give the user an easy-to-read and quick consultation tool. For each one there is a brief description, the updated state-of-the-art, a comparison between advantages and disadvantages, the impact on tenants and the suited climate. Three different renovation scenarios were conceived and simulated. The first is a minor renovation, “business as usual” replacement of the components that have reached the end of their lifetime with new ones that follow the minimum BBR requirements. 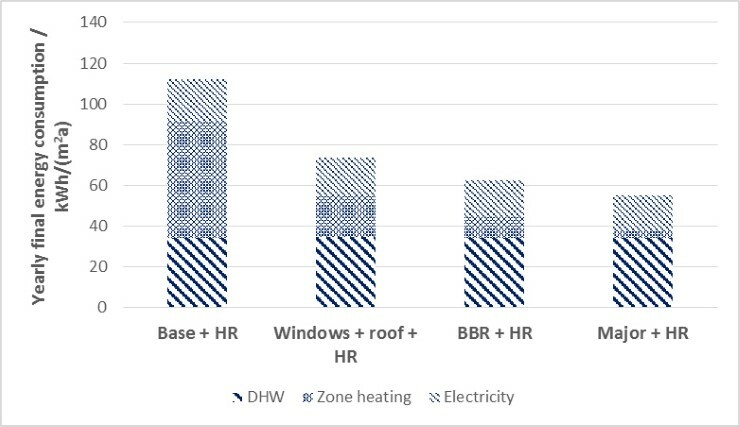 Then a “BBR scenario”, which means upgrading the whole building envelope to the minimum BBR requirements, and finally a major renovation to obtain a 50% reduction in final energy consumption compared to the base case. To reach the 50% reduction in energy consumption, it was calculated that it is enough to replace all windows with double glazed ones with a thermal total transmittance of U=1.3 W/(m2K), install a supply and exhaust ventilation system with heat recovery and insulate the opaque envelope elements to ensure that their U-values do not exceed the ones recommended by BBR. This was achieved by insulating (with external XPS) the north and south facing walls with 120 mm, the east and west walls with 90 mm, roof with 205 mm and the ground floor with 185 mm. It is also possible to reach the Miljöbyggnad Silver level concerning energy consumption, (75% of the BBR threshold) by having triple glazed windows with a thermal transmittance of 0.7 W/(m2K), heat recovery and all the opaque elements with a U-value below 0.15 W/(m2K). 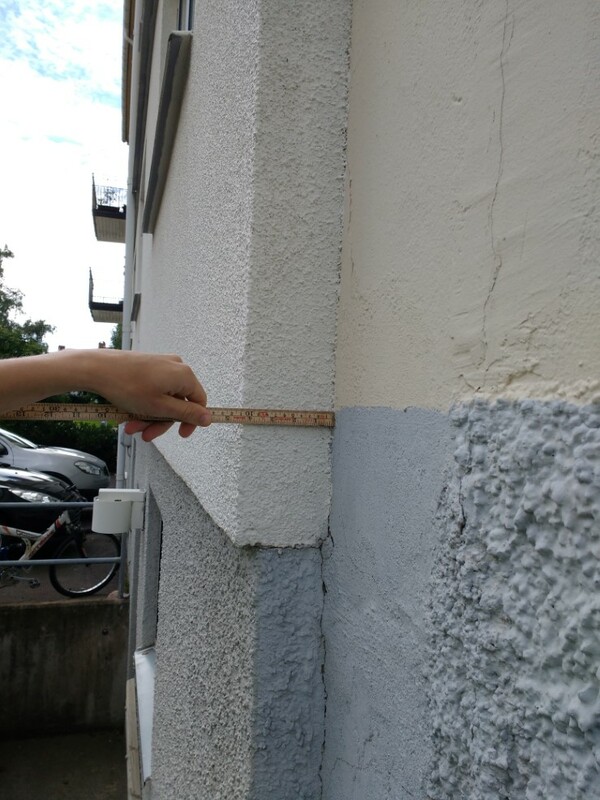 This level of insulation can for instance be reached with additional external XPS insulation: 160 mm on the north/south facing walls, 130 mm on the east/west facing walls, 180 mm on the roof and 200 mm on the ground floor.